THE ULTIMATE HUMMUS COOKBOOK By Jonathon Becklar & Naheed H.
Copyright 2010/44 Pages/Solar-Vision Publishing/BRAND NEW/Paperback! This cookbook is for fans of hummus, and for people that do a lot of get together's and throw parties, looking to spice things up! Hummus is very exspensive at the store as you may already be aware of and if you buy this book you will never waste your money on store bought hummus again when you can make it very easily RIGHT AT HOME, without all the extra preservatives and additives! 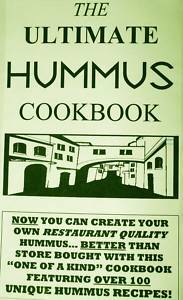 Even better, hummus is a very rich, nutritious, creamy dip with all kinds of variations that are displayed right in this cookbook! There is a section also on pita breads and chips to start your relaxing afternoon or party off right!